A suicide bomber blew himself up as thousands of fans were exiting Ariana Grande’s pop concert in an attack that the PM has called a 'callous terrorist attack'. A lone suicide bomber set off a powerful homemade bomb at a concert of American pop star Ariana Grande in Manchester city, killing at least 22 people and injuring 59 others, in the deadliest terror attack in Britain since the 2005 London bombings. The Islamic State terror group on Tuesday claimed responsibility for the bombing and warned of more attacks. 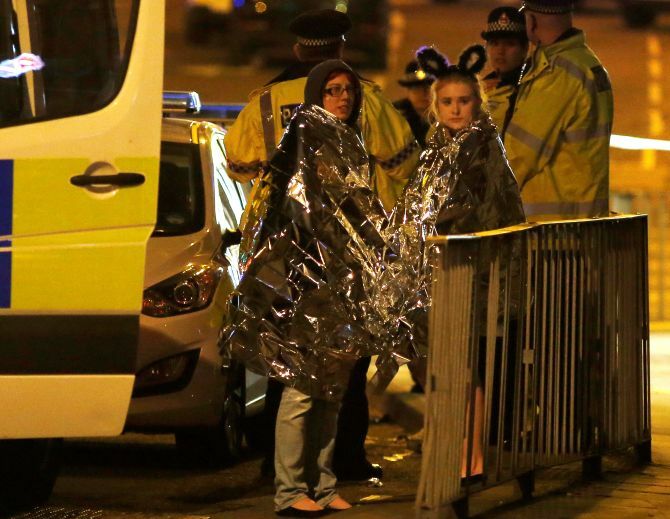 The suicide attacker was identified as 22-year-old Salman Abedi, claimed officials. 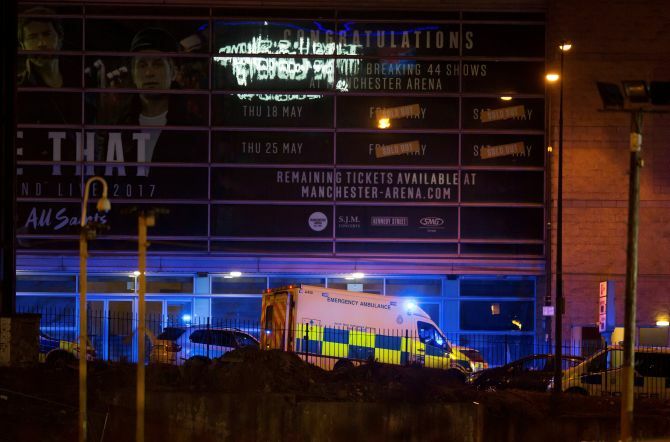 Police confirmed Abedi died in the arena. Abedi, who was born in Manchester, is the second youngest child of a Libyan refugee couple who came to the UK to escape the Gaddafi regime, media reports here quoted US officials as saying. Local reports and reports from US authorities have claimed that Abedi was a British citizen who was known to authorities. Abedi is believed to have boarded a train from London to Manchester to carry out the attack. Armed officers raided Abedi's home in Manchester and ordered residents to stay indoors in the Fallowfield area as they carried out a controlled explosion to gain entry. Abedi is registered as living at the residence and the property is now believed to be the centre of the investigation. British Prime Minister Theresa May said the people of Manchester have fallen victim to a “callous terrorist attack”. After chairing a Cobra (Cabinet Office Briefing Rooms) meeting in the wake of the blast, May said a single terrorist detonated a device near the exit, at a time and place intended to cause maximum injuries. Screaming concert-goers, including children fled the venue on Monday night in panic after the powerful blast struck the Manchester Arena -- Europe’s largest indoor arena. Children and teenagers were among the dead because of the very young demographic of the pop star’s fans. Broken. From the bottom of my heart, I am so so sorry. I don't have words. -- Ariana Grande. “Our thoughts are with those 22 victims that we now know have died, the 59 people who have been injured and their loved ones. We continue to do all we can to support them. They are being treated at eight hospitals across Greater Manchester,” Greater Manchester Police chief constable Ian Hopkins said. “This is a fast-moving investigation...We have been treating this as a terrorist incident and we believe that while the attack last night was conducted by one man, the priority is to establish whether he was acting alone or as part of a network,” he said in a statement. Police has also arrested a 23-year-old man in Chorlton, south Manchester, in connection with the attack. The first victim has been named as 18-year-old student Georgina Callander. British Prime Minister May said if others are responsible for the attack, they will be brought to justice. “Our way of life will always prevail,” she asserted. External Affairs Minister Sushma Swaraj said that no Indian casualty had been reported. The blast comes just weeks before the snap UK general election, campaigning for which was hotting up over the issue of Brexit -- the UK’s exit from the European Union. However, both May and Labour Party leader Jeremy Corbyn suspended election campaign after the Manchester attack. US President Donald Trump condemned the “evil losers” behind the bomb attack. British Transport Police said the explosion occurred in the foyer area of Manchester Arena that has a capacity of 21,000. Eyewitnesses said the explosion was heard after the artist had finished her show and left the stage. Pop star Grande’s spokesperson said she was safe. Grande, a 23-year-old American TV teen actress-turned-pop star, said that she was “broken” and at a loss for words over the deadly terror attack at her concert. Queen Elizabeth II condemned the terrorist attack in Manchester as an act of “barbarity”. 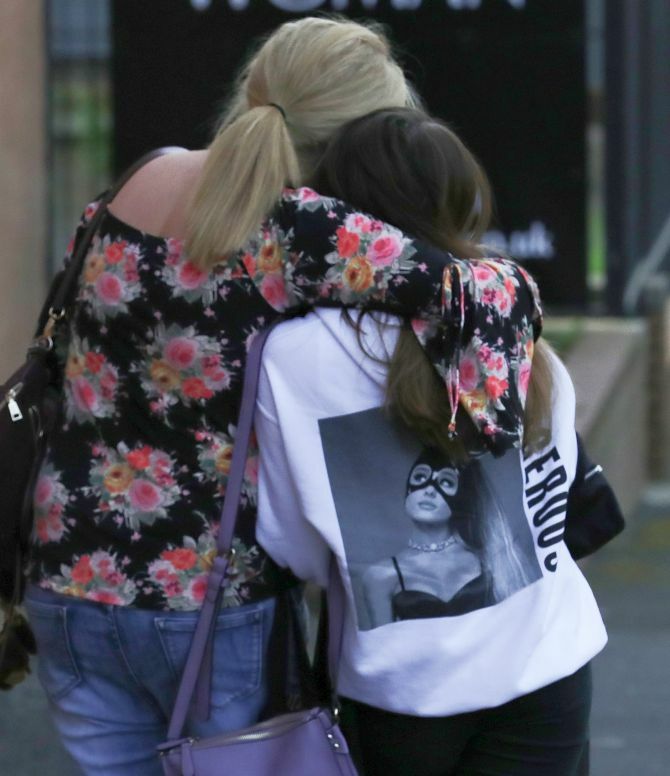 “The whole nation has been shocked by the death and injury in Manchester last night of so many people, adults and children, who had just been enjoying a concert,” she said in a statement. 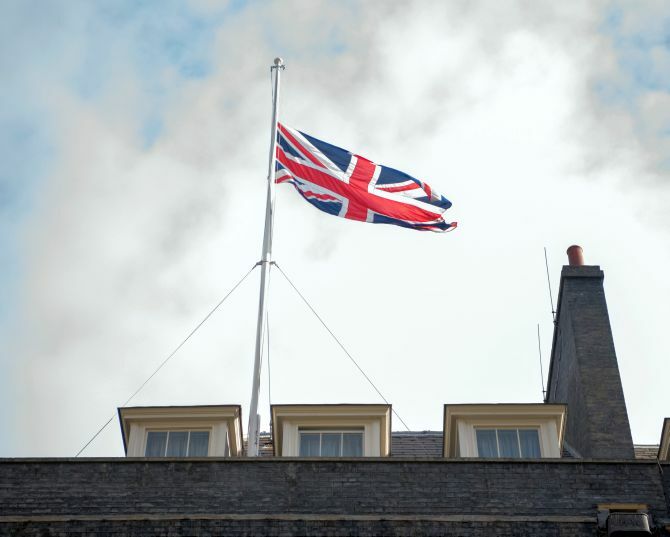 “I know I speak for everyone in expressing my deepest sympathy to all who have been affected by this dreadful event and especially to the families and friends of those who have died or were injured. I want to thank all the members of the emergency services, who have responded with such professionalism and care. “And I would like to express my admiration for the way the people of Manchester have responded, with humanity and compassion, to this act of barbarity,” she said. “Broken. From the bottom of my heart, I am so so sorry. I don’t have words,” she tweeted hours after the powerful blast. According to TMZ, the singer has indefinitely suspended her world tour in the wake of the attack. Greater Manchester Police also carried out a “controlled explosion” in the CathedralGardens area near the Manchester Arena, but have since confirmed the item they found was abandoned clothing and not dangerous. 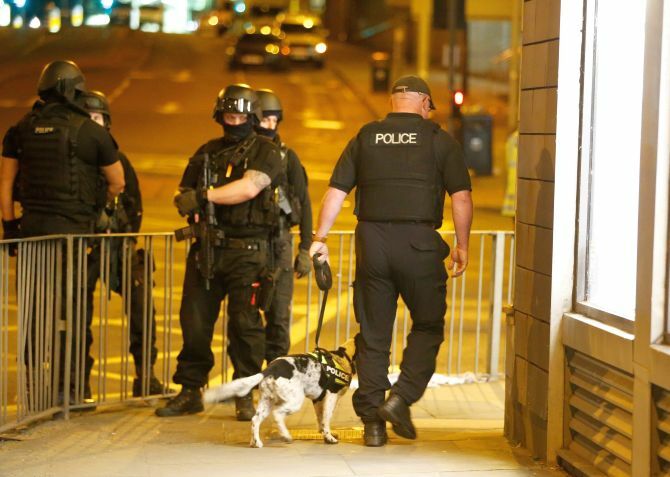 Armed police lined the streets outside the arena with officers moving members of the public away and bomb disposal units at the site of the blast. UK Home Secretary Amber Rudd described the incident as “a barbaric attack, deliberately targeting some of the most vulnerable in our society”. Eyewitnesses reported hearing a loud “bang” from inside the venue. Video footage from the scene showed bloodied victims being helped by emergency services. 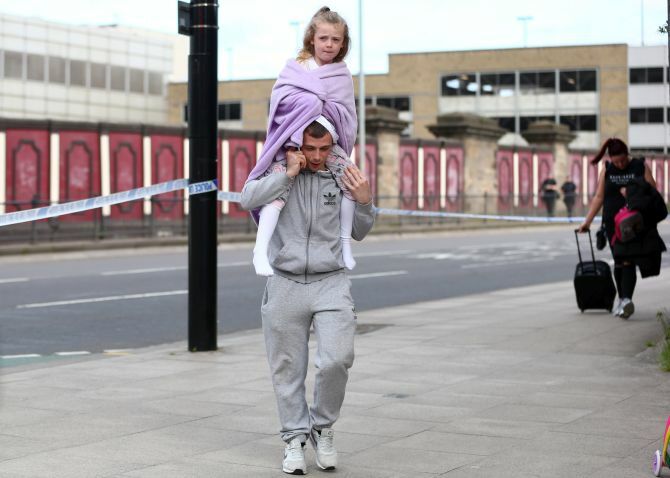 “It was one bang and essentially everyone from the other side of the arena where the bang was heard from suddenly came running towards us,” an eyewitness said. “Some people were screaming they’d seen blood but other people were saying it was balloons busting or a speaker had been popped,” said another eyewitness. The UK’s Network Rail said train lines out of ManchesterVictoria station, which is close to the concert venue, were blocked. Monday night’s blast came two months after a careening driver left four people dead on London’s Westminster Bridge, then stabbed to death a police officer at the gates of Parliament. Monday’s blast was also the deadliest after the July 7, 2005, London bombings, that were a series of coordinated terrorist suicide bomb attacks in central London. The bombings had targeted civilians using the public transport system during the rush hour. Fifty-two people were killed and over 700 more were injured in those attacks. In a heart-warming gesture, Manchester residents opened up their homes and offered help to concert-goers affected by the horrific terror attack at the Manchester Arena. They used the hashtag #RoomForManchester to offer help to distraught people after their night of music ended in tragedy with a suicide bomber blowing himself up at the arena. With many concert-goers struggling to get home, #RoomForManchester started trending on Twitter with many volunteering their homes to stay in, BBC reported. 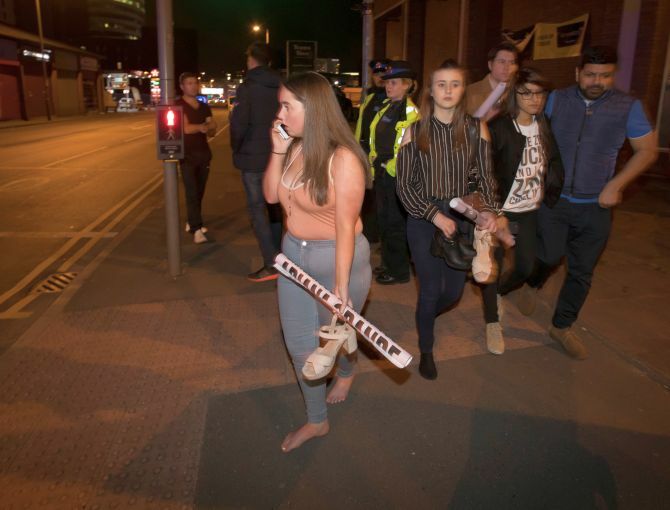 There were reports that a hotel near Manchester Arena had taken in over 50 children who were unaccompanied at the gig. Gurdwaras in Manchester also offered free food and shelter to affected people. Actor Eamon John Gannon was among those offering help. “I’m 10 mins away from the arena and if anyone needs food drinks or charge your phone or a sofa or anything get in touch #roomformanchester,” he tweeted. And lots of more Manchester residents also offered their spare rooms and sofas to sleep on. Local pubs and a snooker hall were also reported to be been taking people in. Taxi drivers were also seen offering people free taxi rides, and people were already arranging to give blood at donor banks to help those injured. Driver A J Singh said he tried to help wherever he could. “We should come out and show whoever's done this that it doesn't matter because Manchester, we're glue and we stick together when it counts." ‘Muslim taxi drivers giving free lifts, Sikh temples giving food and beds, locals giving blood in the morning. Proud to call Manchester home,’ tweeted Emily Bolton a local resident. Liverpool City Region Metro Mayor Steve Rotheram, whose two daughters and two nieces were at the concert, praised the ‘spontaneous acts of ordinary people’ of Manchester following the attack. “It was at that point that I made the decision that money isn’t everything in life and we’re part of Manchester and we need to do our part to make sure these people get home safe and sound,” Rotheram said. People were also using the hashtag #MissinginManchester to search for people who have not been in contact since the blast.